As part of IIT Institute of Design's intersession, Jon Kolko came to teach his methods from Well Designed. In a day we were tasked with conducting an hour of intercept interviews relating to public transit in Chicago. Claire and I decided on the Metra. We went to 2 of the main hubs in Chicago and talked with regular commuters and tourists. Based off our research we did analysis of the utterances to create insights that would spark a conversation. Each cluster was named with a full sentence to avoid simplicity. Afterwards we asked why it mattered, why it was important? This helped create the insights that challenged us and our theoretical client of Metra instead of ones we could comfortably accept as truth. From there we designed an app to improve Metra service. 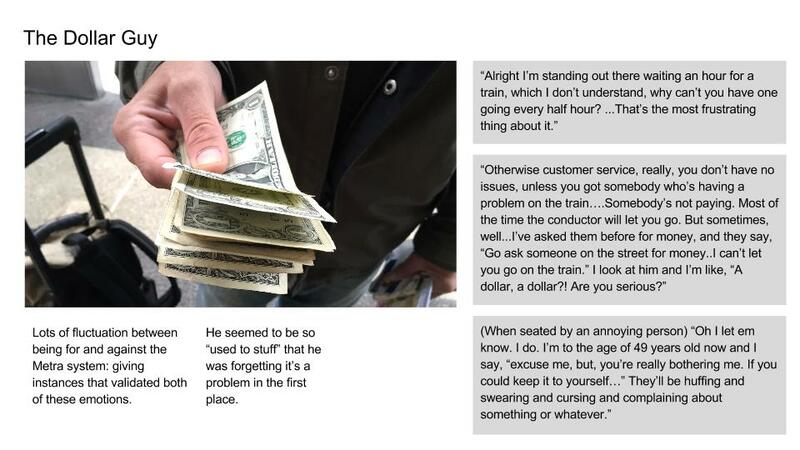 Promotes honest, anonymous feedback to the conductor to diffuse uncomfortable situations amongst riders in order to enhance personal sanctuaries on METRA.